Thread Details Posted by carid, this thread has received 0 replies and been viewed 80 times. The season of huge savings goes on at CARiD.com! Today we welcome you to take advantage of our freshest promotional offer from XF Off-Road. If you’re planning to upgrade to the custom set of superior and reliable off-road rims this spring, the time to act has come! 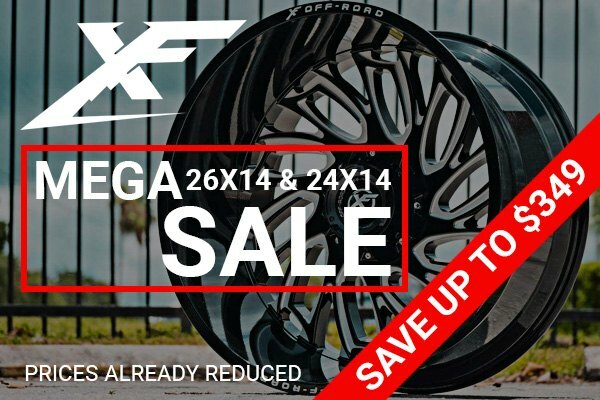 Just now SAVE up to $349 off the original price with 26x14 or 24x14 XF Off-Road wheels. Prices are already reduced. XF Off-Road products are available in a wide range of durable, scratch-resistant finishes, multiple sizes and extraordinary styles to fit the needs of even the avid off-roaders. Conquer any unforgiving off-road terrain easily with XF Off-Road at CARiD. Find a matching set of tires here.